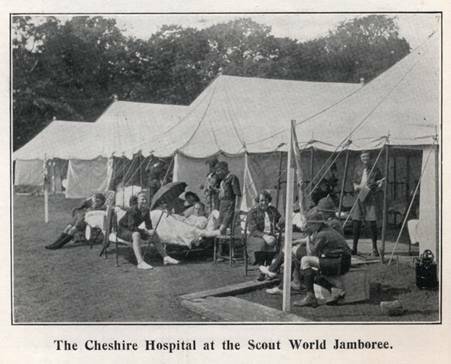 Miss Royden will you and your Guide people run a hospital under canvas for the Scouts at the Jamboree ? So asked Major M.B.H.Ritchie Jamboree Assistant Camp Chief in charge of health. Miss Mary Royden County Commissioner for Cheshire Girl Guides said "Yes", then later came the realisation of the enormous responsibility involved. After a meeting with Major Ritchie and his assistant Lt.Colonel. J.C. Holdich a request went into Cheshire's County News letter explaining what was required and requesting volunteers. This brought in a wonderful response. There was all kinds of work to be done besides nursing. All the offers of help were sorted into the different kinds of work they were best suited for. A committee was formed to help with equipment and other matters. An appeal through County News brought in a fund of approx £100.00 which was used to help with incidental expenses. Boy Scout HQ provided tents, marquees, surgical and medical equipment. It was decided that the hospital should be in a sunny and sheltered part of Arrowe Park. There was a reception tent with a Sister and nurses to receive incoming patients. The hospital was entirely under canvas and consisted of eight large marquees. Four were used as wards, each containing sixteen beds, giving a total of 64 beds. One was used as a Dispensary and Operating Theatre, another as a Dental Clinic and Out-Patients Department. The last two were the Office and Store Tent/food preparation area. All except the Store Tent had wooden floors. There were also two smaller staff marquees, one a Cloakroom and the other a Rest Tent. Six bell tents were used as Isolation Wards. Electricity was provided by a portable generator. The Cheshire Waterworks Company provided running water and waste water facilities as a gift to the hospital. The Birkenhead Fire Brigade provided an ambulance and also lent fire extinguishing appliances. All wards were furnished with beds lent by local hospitals, Birkenhead School and St. Aidan's College. The mattresses by the same institutions and by the Cunard Steam Ship Company. The sheets, pillow cases, blankets and nearly all the pillows were lent by the Cunard Steam Ship Company. All soap was provided by Lever Brothers who also lent the use of Spital Old Hall, an empty house six miles from Arrowe Park. This was used to accommodate hospital staff who did not live near Arrowe Park. The nursing was carried out by Cheshire Guiders, Miss E. Pantin was the matron in charge, she plus the sister in charge and six other Guiders were all qualified nurses. The duties of ward maids, quartermasters, secretaries, cooks, dispensers, patients' aunts, porters, chauffeurs and messengers were all carried out by Cheshire Guiders. In total 110 Guide personnel helped in the work of the hospital. The general supervision of the Guide staff was in the hands of the Camp Commandant Miss M.C. Royden. The hospital opened on July 27 and closed August 15. 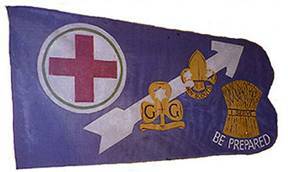 On the opening day Lady Cholmondeley presented the special hospital flag to the Camp Chief, this had earlier been blessed by the Lord Bishop of Chester. During the time the Hospital was open many distinguished visitors came round including H.R.H. The Prince of Wales, His Grace the Archbishop of Canterbury and the Bishops of Chester and Liverpool. The Chief Guide and Chief Scout paid many visits. There were 321 patients from 33 Countries. 86 patients were below the age of 15. 186 patients were between 15 and 19. 52 patients were transferred to local hospitals. 8 patients had an infectious disease, 4 mumps and 4 scarlet fever. Of the in-patients the majority of cases were tonsillitis, chills, cuts, wounds, fractures and fevers. 20 operations were performed in hospital, the majority being the reduction of fractures. There were no deaths among the patients in the hospital. 216 cases were treated in the Dental Clinic. 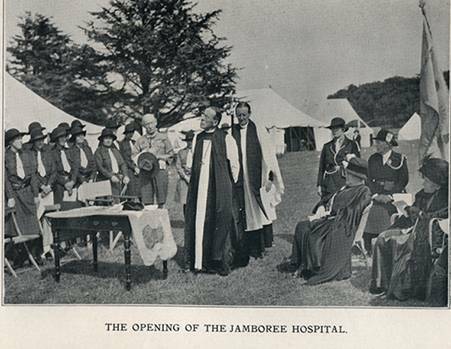 The Hospital staff at the Jamboree, Miss Royden and Major Ritchie are in the centre. 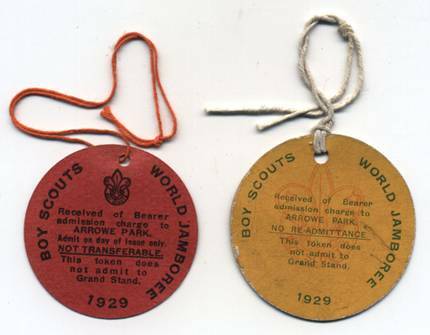 The Jamboree was attended by 50,000 Scouts from 31 parts of the British Empire and 42 other Countries. tokens were issued to the visitors to show they had paid, a different colour for each day with two styles of printing. After the Jamboree Miss Royden received the following letter from the Chief Scout. Now the Jamboree is some little distance back one can look at it in proper perspective, and there looms large among its many successes the central hospital and its great contribution to the well-being and health of the boys. In the organisation and management of this you must have expended an immense amount of time and energy and I hope that your own consciousness of its value will have shown that time and energy was by no means thrown away and that your work was worth while. 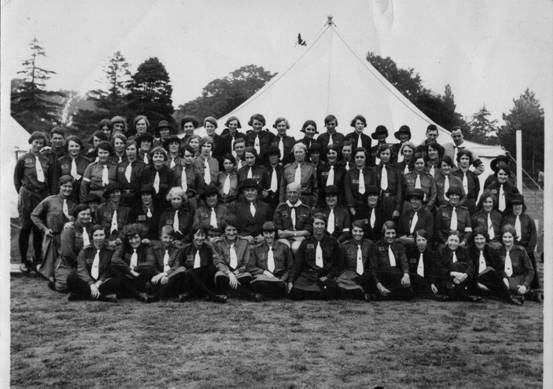 You got together a splendid staff of Girl Guides as workers. To you and to them the Scout Movement owes a deep debt of gratitude. Moreover, their coming to our assistance in that way showed to everybody the high standard of efficiency that the Guides have attained, also it proved the spirit of mutual goodwill and co-operation between Guides and Scouts. It has been a great source of pride both to the Chief Guide and myself that the Guides should come forward and proved themselves in this way. And I want to offer to you personally our most grateful thanks, as well as our congratulations, on having brought about this happy co-operation to such a successful issue. If you visit the Jamboree site you will find the Jamboree monument, on the right, just inside the main entrance to Arrowe Park Hospital. 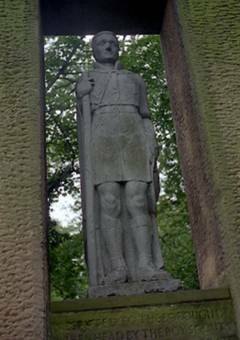 At the bottom is inscribed The Chief Scouts farewell bidding – Today I send you out from Arrowe Park to all the World bearing a symbol of peace and fellowship. Each one of you a ambassador bearing a message of love and fellowship on the wings of sacrifice and service to the ends of the earth. From now on the Scout symbol of peace is the golden arrow carry it fast and far.